"These are so tasty your family won't believe they are eating healthy! Nothing this good for you should taste so good...or be this easy to cook. These are delicious plain, but may be dipped in honey mustard sauce, ketchup, or even guacamole." 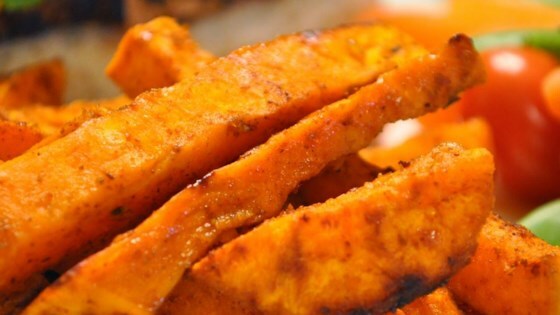 In a plastic bag, combine the sweet potatoes, canola oil, taco seasoning, and cayenne pepper. Close and shake the bag until the fries are evenly coated. Spread the fries out in a single layer on two large baking sheets. Bake for 30 minutes, or until crispy and brown on one side. Turn the fries over using a spatula, and cook for another 30 minutes, or until they are all crispy on the outside and tender inside. Thinner fries may not take as long. Tasty but oh so soggy.... you've gotta eat them REALLY quick. i loved them. i used someones advise and used cinnimon, sugar and salt instead of the taco seasoning.